Aeta UI: Renamed ControlType to ControlTypes in UserInterface, and added OnControlsChange event. Aeta UI: ImageElement's SnapSize now calculates from Source instead of the texture's width and height. Aeta UI: ImageElement's SetOrigin now calculates from Source instead of Texture. Merchantry: Added item buttons to the top of the backpack. Aeta UI: Fixed an issue which caused removed elements to keep rendering. Aeta UI: Added proper scaling to SetHoverBoxCheck(). I’ve made a lot of progress on the tile editor. The Layers UI is for adding new layers, removing layers, hiding layers, and selecting what layer you will be editing. The Tile Viewer UI is for adding new tilesets, removing tilesets, and most importantly, selecting what tileset and tile you’ll place. You can see both of these in the video above. I’ve considered how nice it would be to have auto-tiling, and I hope to add that function soon. It’s lower priority on the to-do list though. I felt inspired yesterday to draw some animals. It was good timing, since I needed a creative outlet and a break from coding. I added the pig in the second picture for size reference. I recorded myself drawing these guys, too. I’ll edit it into a timelapse soon and release it for Patrons. Current Goals: Finish tile editor, release Aeta UI. Future Goals: Implement saving, create meta-content. Retweet, repost, boost, and share! Aeta UI: Elements can be relatively positioned to other elements with SnapExterior and SnapInterior. Aeta UI: Moved Camera, KeyInput, and Controls to a common code library. Extensions: Copied a lot of code from Aeta UI and Merchantry into a common code library. Extensions: Added height to shapes. Aeta UI: CheckboxElement has been greatly improved. Aeta UI: Removed AnimatedCheckboxElement, AnimatedButtonElement, and AnimatedImageElement. Aeta UI: Added SnapCircular to Element, which allows an element to be snapped to another element's circular edge. Merchantry: Pressing the escape key will briefly display the top-right menu. Merchantry: Replaced the "notification tutorial" with the Controls message, which pops up shortly after the first event. Merchantry: Customers will no longer endlessly spawn when the game is paused. Merchantry: UI objects will display a tooltip with their name. Merchantry: 1920x1080 monitors can no longer see the map edge when talking to Sproule. Merchantry: Object selection now makes use of ObjectShape. Merchantry: Gorgers will no longer show they can be selected unless the player is holding an item. Merchantry: Version 1.0.1 released, fixing multiple bugfixes. Aeta UI: Replaced all Align*() methods with SetOrigin(). This works as percentages. Aeta UI: Fixed an issue with SetHoverBoxCheck(Point ...) ignoring depth. Aeta UI: Elements now render in the proper order. Aeta UI: Setting an element's render order updates the UI's sorted list. Removed most other SortRender() calls. Extensions: SmoothColor now accepts an actual color for SetLoose(color) instead of a float. Merchantry: When the backpack is closed, world items will deposit directly into the player's storage. Merchantry: Moved notifications from bottom-right to top-left. I've completely changed the UI textures. There isn’t much I can say here that the picture doesn’t already. The previous textures lacked contrast and style, so this is a huge improvement. The inventory has been completely replaced by what I call the backpack. I planned to overhaul the inventory after the alpha release, and I finally prototyped a the best possible version. There were multiple issues with the old inventory, with the biggest being a lot of repetitive actions. Dragging and dropping items to and from the inventory slowly but certainly became tedious. It just wasn’t a smooth gameplay function. The new backpack changes that. Items can be efficiently selected by mouse or keyboard (and gamepad, soon), and then selected item can be grabbed for use in the world. With the backpack closed, items in the world can be quickly pocketed with a click. When it’s open, the item will be grabbed instead. Similar to the inventory, the backpack has tabs. These are the same as before, but with one addition: the furniture tab. This will be for placeable items like crafting tables, anvils, item shelves, barrels, and more. Each tab has a maximum slot count, which will promote use of storage furniture. Current Goals: Release Aeta UI, tile editor. Merchantry: Some recipes may take longer to craft. Merchantry: Removed the "Take All" button from Sproule's stall, preventing you from stealing all of his wares. Merchantry: Added prices to markets. This includes your stall and Sproule's. Merchantry: Added a secret, craftable item. You won't find it in the recipe book. Merchantry: Sproule now accepts gifts. Merchantry: Adjusted customer display name height. Merchantry: Finished the What's Next? section in Info. Merchantry: Fixed notification icon positioning. Merchantry: The stranger will leave if ignored for too long. Merchantry: Tooltip no longer shows last result from world when in inventory. Merchantry: The Inventory stays in focus when the player clicks in game world. Merchantry: Added simple control tutorial through notification system. Merchantry: The "Exit", "Info", "Controls", and opening event pause the game. Merchantry: Resolution now adjusts automatically, and the game starts in fullscreen. Website: Finished the webpage for Merchantry. Code Library: Started a new code library called "Fluid Dynamics". Aeta UI: Merged RenderElement with Element. Aeta UI: Added X and Y axis variables to Element. If you didn’t hear the announcement, I’ve released Merchantry for public testing and feedback! You can download it completely free on the Merchantry webpage. I've completely redone my Patreon page's layout, and removed Monument from everything related (temporarily -- or perhaps permanently). I want future patrons to feel like they are supporting my work, as opposed to donating for access to it. Tier rewards are different now, focusing on meta-content such as behind the scenes videos and images. Initially, this will be two categories. Artwork, where I’ll do timelapse and aesthetic breakdown videos. Code, where I’ll do videos that highlight features, and in-depth guides on how I do certain things. Besides the meta, I will likely release content (games, software, etc.) to Patrons first, and then delay the public release by two weeks or more. Additionally, tiers and Discord roles have been changed from to Level One, Level Two, Level Three. If you like what I do and want access to behind-the-scenes content, please consider becoming a patron. Current Goals: Promote Merchantry, implement feedback, various small coding projects, create meta-content. Future Goals: Long-term? To be decided. Merchantry: Split items from the same stack no longer merge when being added to a UI object. Merchantry: Your currency no longer disappears from your inventory when buying from Sproule. Merchantry: After running out of stock, Sproule may buy wares from your stall. Visit percentage scales with happiness (up to 30%). Merchantry: Added Fishing Rod and recipe, and changed Gorger Chow name to Common Bait. Merchantry: Characters passing by may purchase items from the player's stall. Merchantry: Sproule will leave to get new wares if the user doesn't interact with him for awhile. Merchantry: Hovering over a customer displays their profession. Merchantry: Added characters that will pass through the town instead of buying from the player. Farmer. Common bait, stone axe, stone spade. Builder. Stone hammer, iron hammer, stick, stone. Woodsman. 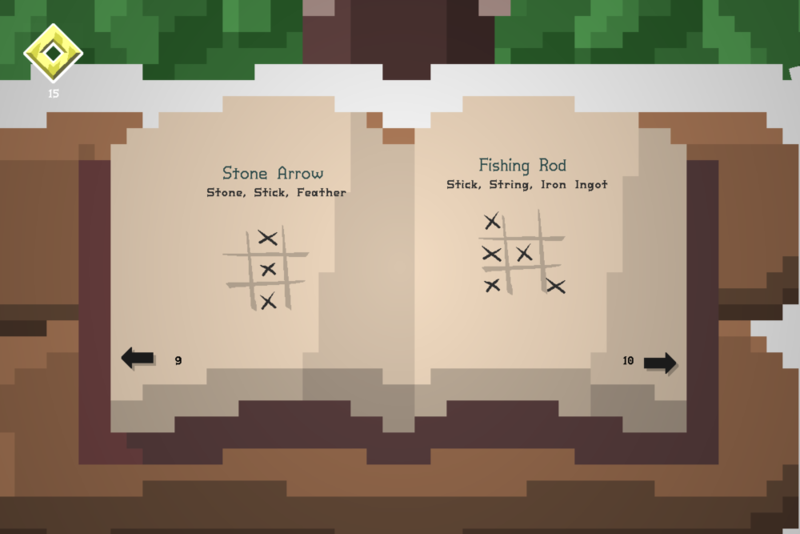 Iron axe, wooden bow, ironn bow, stone arrow, iron arrow. Traveller. Stone cudgel, iron dagger, iron longsword, stone arrow, iron arrow. Fighter. Iron dagger, iron longsword, iron bow, iron arrow. Artisan. Stick, stone, string, feather, iron ore, iron ingot. Miner. Stone axe, stone pickaxe, stone spade, iron pickaxe, iron spade. Fisher. Fishig rod, common bait, string, feather. I will add in-depth selling eventually, such as haggling. However, this will do for the alpha release. This is a simple UI that provides the player with short but important information. It will tell the player what customers have purchased from your stall, when a stampede is coming, when birds approach, and if Sproule returns. Every now and then, a stampede of gorgers will make their way through the town. As they trample through, stones and iron ore may appear in their trail. Merchantry: Removed clickboxes from tooltip UI. Merchantry: Fixed the flickering glitch caused by texture atlas bleeding. It's a really primitive solution, but it works I guess. Merchantry: Ground tile layer has been extended slightly to accomodate 1920x1080 screens. Merchantry: Added code for random bird events. Merchantry: Added Feather, Stone Arrow, and Iron Arrow. Merchantry: Added crafting recipes for arrows. Merchantry: Gorgers now dig for items, either when fed gorger chow or occasionally after wandering. Merchantry: Finished adding simple descriptions to items. Merchantry: Gorger Chow can now be emptied. Merchantry: Changed gorger chow icon from a bottle to bait. Starting Event. Introduces you to your surroundings and how you got there. Stranger Event. A cloaked figure peeking around the corner. Bird Event. A flock of birds will pass by the town. Click on them to make them drop items. Sproule is a frog-like fellow from Lake Oro. Despite lacking the townsfolk’s trust, he travels to the nearby hamlet to sell his wares anyway. Sproule will always have a supply of sticks and stones, while the rest is randomized. Current Goals: Events (if any), selling, polishing.